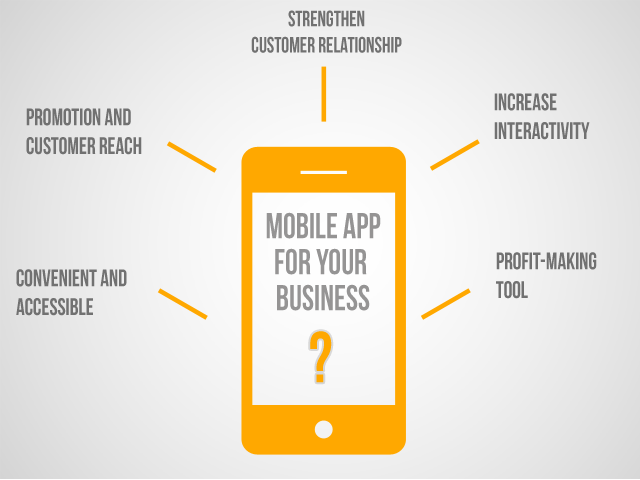 WHY DOES YOUR BUSINESS NEED A MOBILE APP? | Pebble Infotech Pvt. Ltd.
Home Blog WHY DOES YOUR BUSINESS NEED A MOBILE APP? HomeBlogWHY DOES YOUR BUSINESS NEED A MOBILE APP? The mobile app revolution is simply wonderful. Which merchant in the world would have thought that internet and mobile phones or tablets can compress their entire store and make it available at their customer’s palm? Still sounds pretty fascinating, doesn’t it? But if you have been sitting at the shore looking at the modern waves of mobile apps swab away, then be aware my friend, you might just miss the boat. Over the past decade, Cell phones are not just limited to calls, SMS or even the latest songs and images. Mobile phones today are so smart that it has found its use in our everyday jobs. Mobile apps were originally offered for general productivity and information retrieval, including email, calendar, contacts, and stock market and weather information but with time, today apps can do some really impressive things – from entertaining you to alerting you; from isolating you from the crowd to connecting you with the whole world; there are over 1 million mobile applications out there today performing a huge range of tasks and it’s a must for your business, irrespective of its size and commerce to have one. How does a Mobile app help me to improve my business? Questions might be many, answers are the same. So, let’s go ahead and find the answers. The very first reason why apps are in fashion is because it’s easy. It’s easy to access the program through a gadget that you carry wherever you go. It’s easy to view what you want at a touch. It’s easy to update the necessary information about the product or service you are endorsing. As a business owner, it’s easy to find how your business is doing twice or thrice in a while. Finally it’s easy to do the easy thing. Whether you are having a slurp of your hot drink or on the road, if you have your phone, you have your company with you. You sure have a fully designed up and running website but did you know, by the end of 2014, mobile internet usage is projected to overtake desktop internet usage? So, rather than shrinking the dimension of your website, it will be a wise decision to go for swifter and dependable smartphone apps that reach many more customers and actually provide offline access to content or perform functions without a network connection. Developing a mobile app and promoting it among your users is therefore extremely effective mode of marketing and launching new products to a broader audience, which in addition is a confirmed way of boosting your business by increasing the visibility. A mobile app will increase the exposure of your business connecting you with on-the-go consumers. You are in reach with your target customers in a generic search or good words by existing customers. Forget the newspapers, pamphlets and even websites, most of all, forget the problem of getting stuck in spam folders. Instead, have instant direct access to local and international consumers through your app, feature different new products, interesting offers and discounts. Mobile apps are a great way for a business to communicate directly with their clients. It will enhance your Social networking strategies and lets your business experience every benefit of Social Media Engagement. It helps facilitate employee communications regardless of the location; also, effective handling of queries or complaints becomes way easier for continuous improvement. You can learn about your audience by means of their preferences, locations, age group etc. A mobile app is the best tool in the foreseeable future that is going to keep the business and consumers interactive. Good customer support is essential to keep getting new recommendations, and a mobile app is the best choice one can make. It can also be used to collect feedback and data about customer behaviors and learn how customers are using your products and services and what they like and what they don’t. If you are afraid to make an investment then, I am afraid you shall receive no return. Numerous small businesses still keep away from developing their personal mobile apps because they fear that the costs would far exceed their budget. Find out about budget-friendly plan – Small Business and Social media. Back to the topic, whilst, I agree app development can sometimes take away a big chunk of your capital, it can at the same time bring you bigger amount only if you know what you want for your business. Go for a simpler, basic app that fulfills all your requirements. Comparatively the reach of your advertisement of new products or services to a similar range of consumers an app can cover; by any other means will cost you even more. Once your app has been developed, you can think of money making on it by using the various app monetizing techniques available like in-app advertising of some corporate funders. WORDS OF WEBISDOM: Getting into partnerships with other similar companies as yours will help you bring more business for you. Teaming up with parallel businesses is sure to be beneficial to both parties involved, leading to shared promotion and increased profits. At this point of time, when half of the internet searches occur on a mobile device, small businesses that ignore mobile apps might be putting their future growth at risk. If you are making your mind up whether to develop a mobile app for your business, consider the entire benefits of a mobile app for customers including your business approach, your competition and your team. Your apps create a virtual office for your business; facilitate customer interactions, its cost-effective marketing, it expands new platforms for improvement and so on. Moreover, it will guarantee you to obtain more sales and popularity. With the smartphones industry blooming, if you now feel almost ready to embrace technology for your business, don’t hesitate to start a friendly conversation with us; your calls and emails are most welcome.